organized by The Department of English K L University, Vaddeswaram - 522 502. Guntur Dist. Theory and practice of cultural spaces in Canada and India; Cultural Landscapes; India and Canada; Government Policies for preserving and creating cultural landscapes, spaces and heritage, Cultural Spaces in Arts and Literature, Indo-Canadian Diaspora, Environment, and Ecology; Building bridges of friendship through literature and performing arts, Indo-Canadian Films and Film Makers, Cultural Spaces and Immigration, Synergy in Energy: hydro, thermal, and nuclear power Digital Media and cultural spaces in communication, Higher Education and Public Policy: Canada and India, Challenges and Directions in Literary and Cultural Studies: The Canadian and Indian Context, Marginalised/Subaltern Cultures and Voices: Canada and India. Humanities and Social Sciences is being organised by Bhavan's College, Ahmedabad on 22nd and 23rd October. 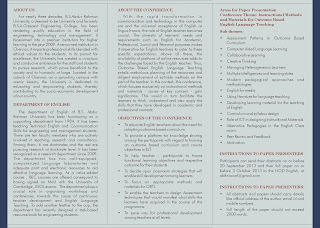 "Literature, Language and Communication: An Essential Trident"
Sir/Madam, Its a matter of great pleasure that Amity School of Languages, Amity University, Lucknow Campus in Collaboration with Shakespeare Society of Eastern India, Kolkata is going to organize an International Conference on "Literature, Language and Communication: An Essential Trident" on the 09th & 10th December, 2013. The Conference invites scholarly papers from intelligentsia. It provides a platform to interact with the renowned Experts from USA, UK, Japan & India. Experts from these countries have already given consent. Along with this, selected papers would be published in a Book form with ISBN No. In the series of the IMRF Confernces, IMRF is privileged to organize International Conference on English Literature on November 15th & 16th , 2013 at Vijayawada, Andhra Pradesh, India. for which we cordially invite your active participation. If you are looking for only presentation you can send abstract and suppose if you are looking for both presentation & publication we request to send your full papers by 17/08/2013. Once we get your full paper we will forward it to the peer review and as we receive the acceptance from the peer review committee we will come back to you and then you can complete the registration formalities. If only a listener participant one can start registering, if so we will send the Registration Form & Payment Methods.